Home > Untagged Motor Trend Test R35 GT-R 3.2 seconds to 60mph. BAM! The GT-R leaves the line like an arrow from a cross-bow. From the outside, the rear tires spin for a little over a foot, the fronts never visibly slip. The acceleration screen on the center dash confirms the test equipment's assertion that longitudinal acceleration of at least 1.0g persists for almost two seconds. No wonder the forged-aluminum rims have little knurled ridges to keep the tire beads from slipping. Despite the big gs, the car doesn't squat much (Launch Control does NOT loosen rear jounce control to induce squat like many such systems do). That 3.2-second zero-to-60 mph time ties our best runs in a Porsche 911 Turbo and a 911 GT3-R, and trails only the Ferrari Enzo (3.1 sec) and Bugatti Veyron (2.7 sec) among production test cars. 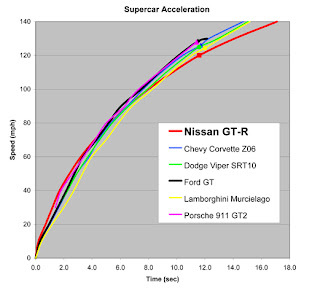 Our 11.6-second quarter-mile time ties the mighty Mercedes-Benz McLaren SLR's, but 13 other supercars manage to squeak ahead of our GT-R's elapsed time. See, RED is faster. 0-60 in 3.2 and 11.6@120mph. Edmunds- Inside Line should have picked a red car.